Today is Richard Aguirre’s birthday. Richard is our go-to guy for graphic and artistic needs. You’ve seen his work – on our new brochure, the newsletter many of you will get in the mail soon, the Bicycle Adventure team’s trailer, etc. 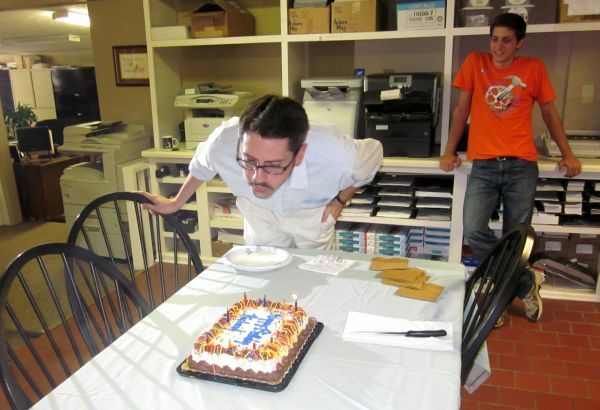 Since I work closely with Richard, I got the cake … AND the candles. So I went all out and forked out the $1.29 for the candles that keep relighting after you try to blow them out. Besides, there’s a sense of excitement around here. As folks out there learn about the Fuller Center’s work, they want to support and be a part of it. We’re seeing it more and more these days. And those fun folks on the Bicycle Adventure are helping to draw some of that support to us. So, there is good reason for us all to smile. Our mission is growing, as is awareness and support. All of which ultimately leads to giving children around the world a reason to smile as they lay their heads to sleep inside a simple, decent home. Click here to get involved with the Fuller Center for Housing.